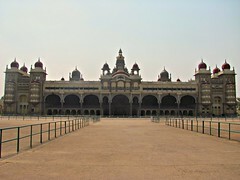 Mysore has been an important centre of religion, education and culture for centuries. 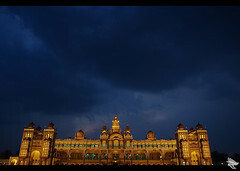 The lavish ways of the Maharajas find reflection in the numerous palaces and parks. Rail Museum (Timings:1000 to 1300 & 1500 to 1700 hrs.Closed on Mon, Entrance : Rs. 2/- Adult & Re.1/- Child). Chamundi Hills (13 Km.) : Famous for the Chamundeswari Temple. Brindavan Gardens & Krishnarajasagar Dam (19 Km.) : A beautifully terraced garden laid out on the side of the dam. The illuminated gardens and musical fountains are special features. Illumination timings :1900 to 1955 hrs. (weekdays),1900 to 2055 hrs. (weekends and holidays), Musical Fountain Timings :1900 to 1910 hrs.& 1930 to 1940 hrs. (daily). Entrance Fee : Rs. 2/-. Accom. :(1) Hotel Krishnarajasagar, Tel: 08236-57222/260, (Rs.750 - 1200/-.) (2) Hotel Mayura Cauvery, Tel: 57252, (Rs.135 -260/-). Ranganathittoo Bird Sanctuary (16 Km. ): An heaven for migrant birds. Somanthpur (45 Km. ): Famous for the Keshava Temple, a perfect example of medieval Hoysala architecture. Other excursions are to Talakad (45 Km. ); Melkote (48 Km. ); Bandipur National Park (80 Km); Shivasamudram Falls (80 Km); Bylakuppe (83 Km); Biligiriranga Hills (86 Km); Nagarhole National Park (96 Km); Sravanabelagola (112 Km.). Area : 37.4 Sq.Km. Altitude : 770 Metres. Temperature : Summer: Max: 35 Deg.C. Min: 20 Deg.C. Winter: Max: 28 Deg.C. Min: 14 Deg.C. Season : Throughout the year. STD Code : 08236. Air : The nearest airport Bangalore(140 Km.) is connected with major cities. Fare : Mumbai - Bangalore : Rs.4045/- (Y) ; Rs.6010/- (J). Rail : Mysore is connected by rail with major cities and towns in South India. Mudumalai 99 Km., Ootacamund 159 Km., etc. Hardinge Circle, Tel: 522202. Fax: 656781. Vinoba Road, Tel:438141. Fax: 421689. Leeladaripura, Tel: 473437. Fax: 473590. Jhansi Laxmibai Road, Tel:421142. Fax: 438384. Vivekananda Road, Tel: 410366. Fax: 514400. The tariff of the following hotels ranges from Rs.300/- to Rs.600/- for a single room and from Rs.500/- to Rs.1000/- for a double room. Tel: 435912, Fax: 429304; Hotel Dasaprakash, Gandhi Square, Tel: 442444, 444455, Fax: 443456, Mysore Hotel Complex, Nilgiri Road, Tel: 462171-9; Hotel Roopa, Bangalore-Nilgiri Road, Tel: 443770. Fax: 443755; Hotel S.C.V.D.S.,Tel: 521379; Hotel Siddartha, Nazarbad, Tel: 522999. Hotel Mayura Hoysala (KSTDC), J.L.B. Road, Tel: 425349 (Eco-Sgl : Rs.250/- Dbl : Rs.300/-, A/c Exec Sgl: Rs. 350/- , Dbl : Rs. 400/-, Suite : Rs.700- 800/- ); Mayura Yatri Niwas (KSTDC), 2, J. L.B. Road, Tel: 423492. (Non.A/c Sgl : Rs. 200/- Dbl : Rs. 240/-, 4 bedded Rs. 350/-, 6 bedded Rs.500/-, 8 bedded Rs.550/-); Youth Hostel,Saraswathipuram,Tel: (0821) 544704; YMCA , Adipampa Road. The Manager, KSTDC, 10/4, Kasturba Road, Bangalore. Tel: 2275869 / 2275883. Fax: 2272580 or KSTDC Tourism Information Centre, Mumbai. Tel: 2181658. KSTDC Information Counter, B'lore City Rly Station, Tel: 2870068; Bangalore Airport, Tel: 5220501.; KSTDC Counter, Mysore Bus Stand, Tel: 0821-444997; Mysore Railway Station., Tel: 422719. Tourism Information Centre No.3, World Trade Centre, Cuffe Parade, Mumbai. Tel: 2181658.